Go short at breakout below the neckline. Go long at breakout above the neckline. 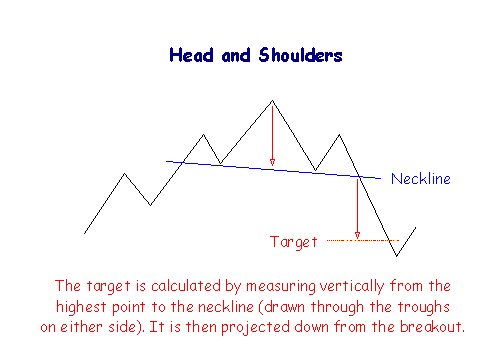 A head and shoulders pattern consists of a peak followed by a higher peak and then a lower peak with a break below the neckline. The neckline is drawn through the lowest points of the two intervening troughs and may slope upward or downward. A downward sloping neckline is more reliable as a signal. The extent of the breakout move can be estimated by measuring from the top of the middle peak down to the neckline. This target is then projected downwards from the point of breakout. A sharp increase in volume on the break below the neckline. 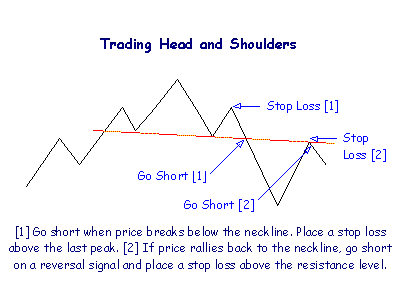 Place a stop-loss just above the last peak. After the breakout, price often rallies back to the neckline which then acts as a resistance level. Go short on a reversal signal and place a stop-loss one tick above the resistance level. Never trust a head and shoulders pattern where the neckline is clearly ascending (the second trough being higher than the first). Also, the more level the neckline, the more reliable the pattern. 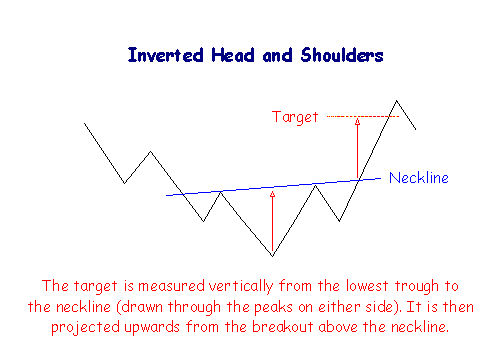 With inverted head and shoulders the neckline is drawn through the highest points of the two intervening peaks. A downward sloping neckline signals continuing weakness and is less reliable as a reversal signal. The extent of the breakout move can be estimated by measuring from the top of the middle trough up to the neckline. This target is then projected upwards from the point of breakout. A sharp increase in volume at the breakout. Place a stop-loss one tick below the last trough. There is frequently a correction back to the neckline, which then acts as a support level. Go long on a reversal signal and place a stop-loss one tick below the support level. 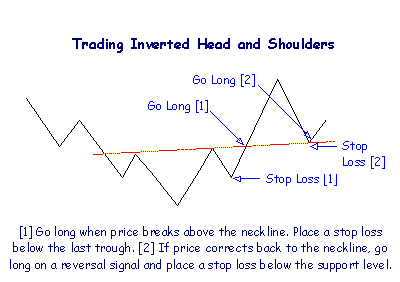 Never trust an inverted head and shoulders pattern where the neckline is clearly descending (the second peak being lower than the first). The more level the neckline, the more reliable the pattern. Chart Patterns Chart Patterns are formed by support and resistance levels and by trend lines. Cup and Handle The cup and handle is a longer term continuation pattern, similar to an ascending triangle. Double Tops Double tops are useful reversal patterns in an up-trend, identified by two peaks of similar height, followed by a break below the intervening trough. Triple Tops Triple tops are similar to double tops and comprise three peaks of similar height. Support/Resistance Support and resistance are the foundation stone of all technical analysis. Trading Ranges Trading Ranges are formed by support and resistance lines in close proximity. Price fluctuates in a narrow band with no clear trend. Triangles & Wedges Triangles and wedges can be powerful continuation or reversal patterns, depending on their shape. 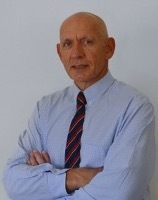 Market Tops & Bottoms William J. O'Neill identifies these signals in 24 Essential Lessons for Investment Success.